Syracuse, NY. Concord Pl. Photo: Samuel Gruber. Syracuse, NY. Concord Pl. looking northeast. Photo: Samuel Gruber. Syracuse, NY. Concord Pl. Porch of 116, looking east. Photo: Samuel Gruber 2018. I recently wrote about Euclid Terrace, the Westcott Neighborhood's hidden English village enclave. 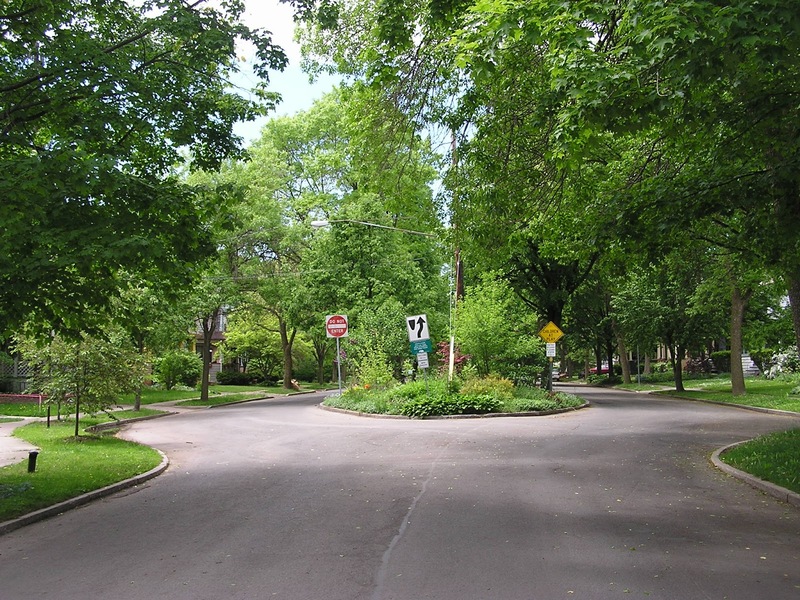 the development of Euclid Terrace in the 1920s may have been inspired by the success of the nearby, but much more public Concord Place, a one-block street between Westcott and Allen Streets that has divided carriageways that wrap around an elongated median that takes the form of an small urban park. The street is lined with impressive houses mostly built in the first decade of the 20th century. 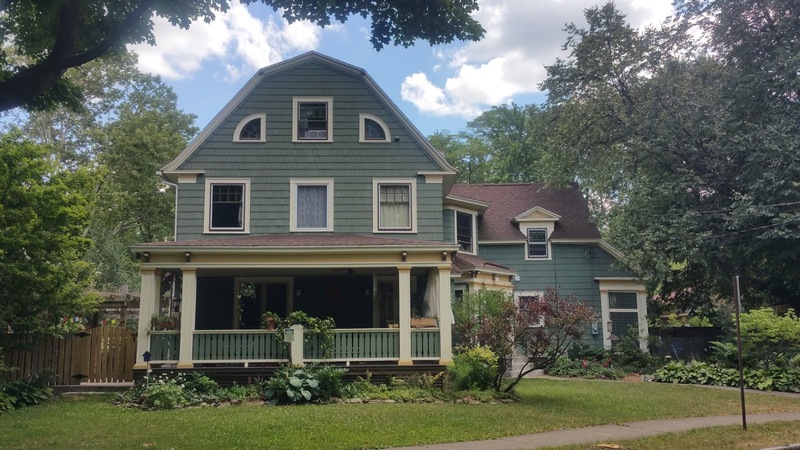 These include some of Syracuse's earliest examples of Arts and Crafts and craftsman houses, including an important work (125 Concord Pl) attributed to LaMont Warner and a transitional design by Ward Wellington Ward (126 Concord), which was the first of his many houses in the area. Other houses on the street are clearly architect-designed but we have not yet been able to make attributions. What is now Concord Place, was originally planned as a plain street known as Wickliffe Street, part of the Hillsdale Tract. Though Hillsdale was promoted in the 1880s, only a few houses were built before 1900, at which time residential development in the area increased rapidly and continued through the 1920s. Syracuse, NY. Hillsdale Tract map, 1889. Photo courtesy Bruce Harvey. Syracuse, NY. Hillsdale Tract amended map, 1893. Photo courtesy Bruce Harvey. 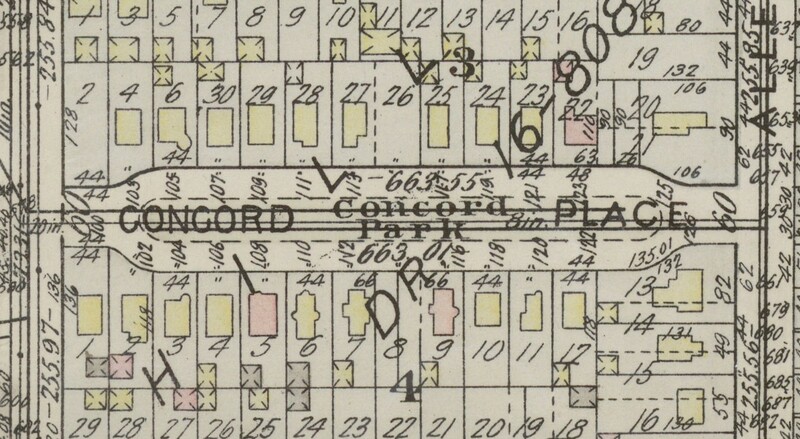 Contrary to common belief, Concord Place, with its unusual elongated oval form, is not in any way a continuation of the driving course which had covered most of the Hillsdale Tract earlier in the 19th century. Syracuse, NY. 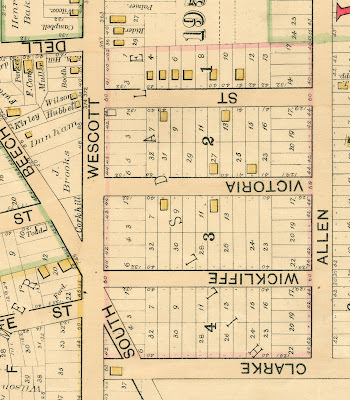 1892 map of Hillsdale Tract, including Wickliffe St (to be renamed Concord Place), detail from Atlas of the city of Syracuse, Onondaga County, New York . (New York: J.W. Vose & co., 1892). Atlas of the city of Syracuse New York (Philadelphia : G.M. Hopkins Co., 1908). Detail of Concord Place. In 1893 the design of the tract was amended with a new map by Mather & Allen, civil engineers. 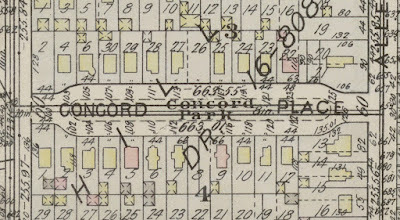 The number of lots slightly lowered, and Concord Place was given its current form. In 1924 the green space was clearly designated as Concord Park. Already by 1908 about half the present-day houses were built on Concord Place; five on each side of the street. The Lamont Warner House, believed to have been built in 1902 by the designer (who moved to Syracuse in 1900), was already complete on a double lot at the northwest corner of Allen Street and Concord Place. 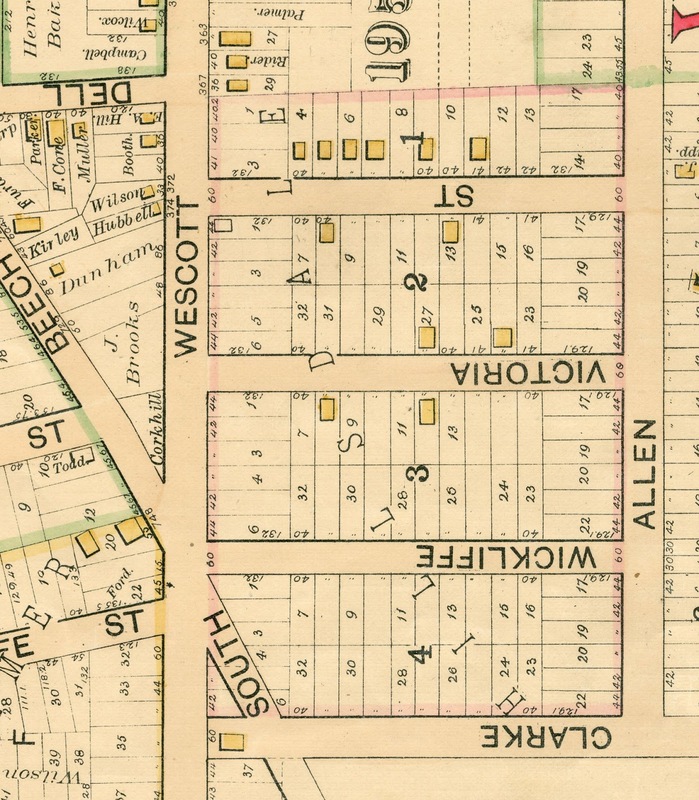 The rest of the 600 and 700 blocks of Allen Street were still undeveloped at the time. Impressive Craftsman-type houses, with steep roofs with large gables and projecting multi-window dormers, shingle siding, and expansive porches are especially found on the north side of the street. 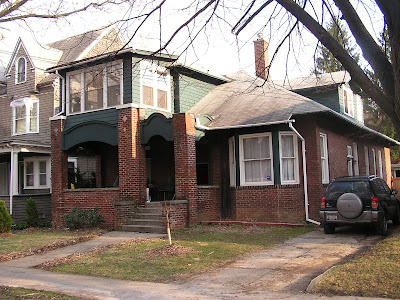 These are transitional designs and also incorporate some elements common to the large late Victorian houses found on the 400 block of Allen street, and which at time were called "Colonial," in part because of the use of Palladian windows and other small classical, Renaissance or Adamesque features. Number 119 and 121 were both built after 1908 - probably around 1910.Both houses utilize elements of the Craftsman style including the high wide gable and projecting eaves, but in a more regular way. We can see even with these large houses that certain patterns are now being more regularly followed by builders. It is quite likely that these two houses on adjacent lots were built by the same developer at the same time. They are not quite twin houses, but share their most important design elements. There are little different form the many Four Square houses being built nearby in the 600 block of Allen Street, except they gable roofs (instead of hipped) and the prominent gabled dormers. Syracuse, NY. 117 Concord Pl. (before 1908). Photo: Samuel Gruber 2018. Syracuse, NY. 119 Concord Pl. (after 1908). Photo: Samuel Gruber 2018. Syracuse, NY. 121 Concord Pl. (after 1908). Photo: Samuel Gruber 2018. Other early houses on the street mix late 19th- and early 20th-century residential fashion in different ways. Number 105 is dominated by a large round corner tower. Though the main body of the house appears to be an example of the then popular hipped-roof Four Square type, the tower creates a very different impression. Though the house is smaller than the Babcock-Shattuck house at Westcott and East Genesee Streets, the role of the tower is the same. The hipped roof also sprouts an unusual polygonal dormer. Across the street at number 116, there is a vestigial round tower on the side of the house, now just a projecting bay. The roof is a cross-gable construction, but the front-facing gambrel roof and gable, incorporating the so-called dutch Colonial Revival style popular after 1900. 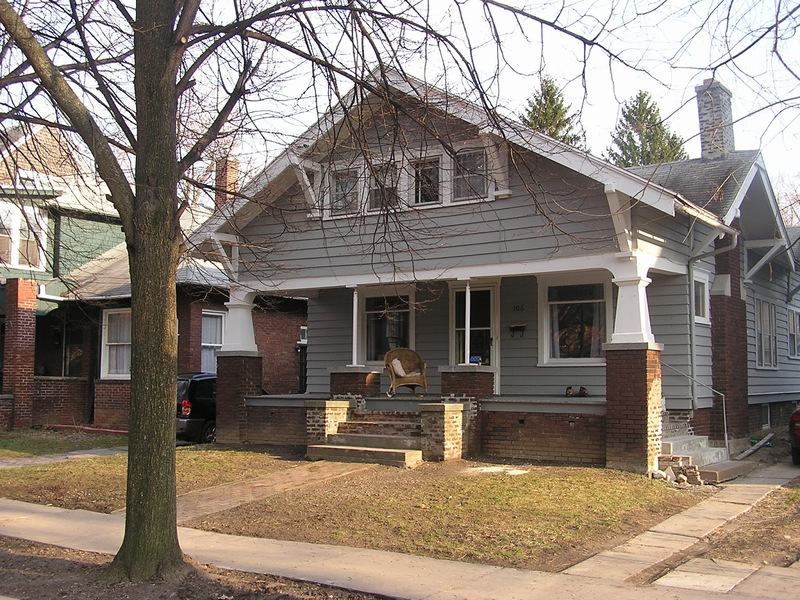 Like most of the house on the street, number 116 has a grand open porch looking onto the center park. Syracuse, NY. 105 Concord Pl. (before 1908). Photo: Samuel Gruber 2018. Syracuse, NY. 116 Concord Pl. (before 1908). Photo: Samuel Gruber 2018..
By 1924, as seen on the map, the entire block was now filled in and 7 of the earlier 10 houses had added small detached garages in the rear and the end of their side driveways. New houses on the south side of the street include a bungalow and a curious brick bungalow-type houses. Atlas of the city of Syracuse, N.Y. and suburbs (Philadelphia : G.M. Hopkins co., 1924). Detail of Concord Place. Syracuse, NY. 106 Concord Pl. Bungalow. Photo: Samuel Gruber. Syracuse, NY. 108 Concord Pl. Bungalow. Photo: Samuel Gruber. Concord Place is just one of several streets throughout the city that are designed with significant green space - either a median or a park - dividing directional carriageways in the manner of a parkway. A comparable short block is on the North Side at the 700 block of North McBride Street. 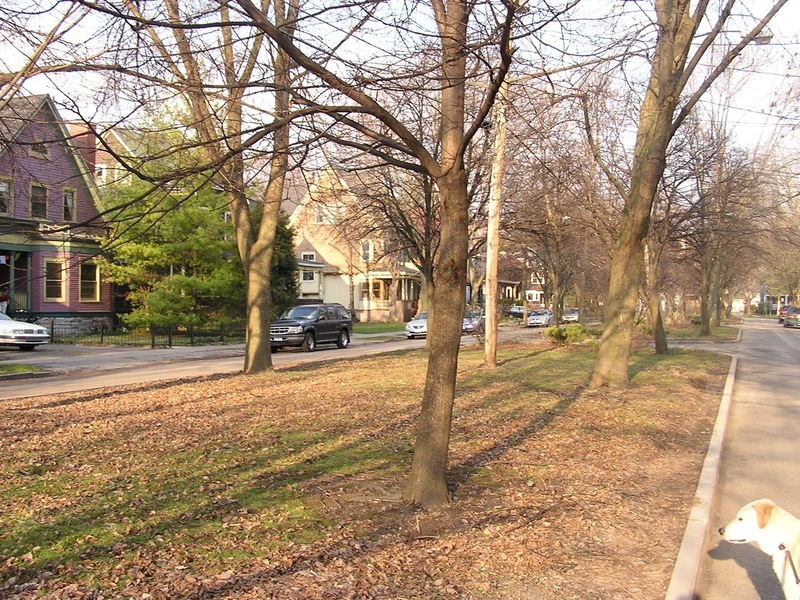 A slightly earlier example of a similar type on the East Side is Walnut Park, developed by George Comstock. 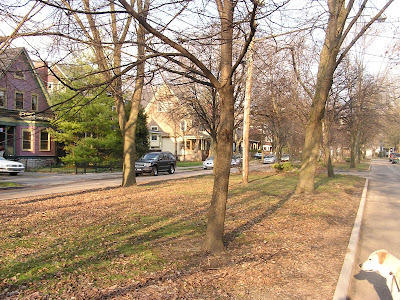 The park runs several blocks between Walnut Place and Walnut Ave. Deeded to the city in 1870 as the heart of a new development area the park was lined with substantial homes and some mansions around 1900, most of which have served as Syracuse University fraternities and sororities since the 1920s. It is quite likely that the Hillsdale developers’ decision to alter the form of Concord Place was influenced by the Comstock development, in the hope of making the block a more exclusive enclave. Syracuse, NY. Walnut Park. Photo: Samuel Gruber. A similar design, but with narrower parkland, is Shotwell Park and adjacent Melrose Avenue in Eastwood. This “greening” of the city was even more popular in the first decades of the 20th century influenced by the practical urban landscape work of the Frederick Law Olmsted and his followers, such as Arthur Coleman Comey, who designed the Scottholm subdivision. On the East Side of Syracuse these developments are more common in Garden Suburb developments (Berkeley Drive, Scottholm Boulevard) in even further East in Bradford Hills (Bradford Parkway, Old Lyme, Hillsboro Parkway, etc.). Syracuse, NY. Concord Pl. Porch of 116, looking northeast. Photo: Samuel Gruber 2018. Thank you so much for this history! Very interesting! I would love to hear what you know about Morningside Terrace since I own a house there and the deed just said 1920 when I purchased it in 2001!